At six foot four and 200 pounds, Alexander Skarsgård looks more like a modern day viking turned Hollywood actor than anything else. Clean, cut and cool, the Swedish national has taken the country with a bit of a hype, especially with the rise in popularity of HBO’s “True Blood,” where he plays Eric Northman, a thousand-year-old ancient vampire — coincidentally of viking decent and bearing all the looks, charms and thrills of a seductive vamp. But looks can be deceiving — Skarsgård has proved to be more than just a type cast for alpha male roles or just a hunky, sultry character. His ventures into acting while choosing worthwhile projects gave him versatility and made him grow to be more of a dynamic and multifaceted actor than the already talented performances the audience witnessed in his portrayal of Sgt. Brad “Iceman” Colbert in “Generation Kill” — his first big break project with HBO in 2008. In the Swedish film “Kill Your Darlings,” Skarsgård also played Geert, a suicidal transvestite — a role very different from the typical Northman or Iceman characters he is usually offered. Son of the renowned actor Stellan Skarsgård, his acting career began in Sweden when he was only seven years old. It was completely different from being a Hollywood child actor. He didn’t have the ordeals of headshots or parents who would take him to auditions. Since his father was an actor, the whole process simply happened organically. It all started with a director friend of his father who offered Skarsgård a role in his film. That quickly led to other projects. He acted for six to seven years until he quit. Although he did not specify what project was the cause of all the attention, in 1989, when Skarsgård was 13 years old, he portrayed the character of Jojjo, in the Swedish film “Hundem som Log” (“The Dog that Smiled”). Skarsgård has lived by that. He realized at an early age that an acting career would be a tough job in life. Most of his father’s friends, although talented, often waited tables into their 40s and 50s. His father explained to him that it was extremely arduous to land a job in the field. However, the ones that are lucky enough to work will have a difficult social life as actors are constantly on the road. Skarsgård didn’t act for eight years through his bit of a rebellious teenage years. After his service in the Swedish military, he attended Leeds Metropolitan University in England. At age 20, he enrolled in Marymount Manhattan College in New York to study theatre. Although he went back to Sweden after only six months, his passion for acting was already reinvigorated. While he worked as a busboy at a restaurant and a coffee shop in Stockholm for a couple of years, Skarsgård auditioned in Sweden. He worked on a couple of movies and plays there, but it wasn’t until he went on vacation to Los Angeles to visit his father who was shooting a film there, that he got his first chance in Hollywood. Since Skarsgård was already there, his father’s manager sent him out to an audition just so he could get a feel for what it was like out there. Skarsgård returned home and spent two more years on stage as he worked in theater in Sweden. Then in 2004, he had finally set his mind and headed back to the States with a collective of friends from Sweden that were musicians, directors and actors. They rented a place together in Los Angeles. Although it took a little over two and a half years for Skarsgård to land “Generation Kill,” it paved the way for great things in this actor’s path. 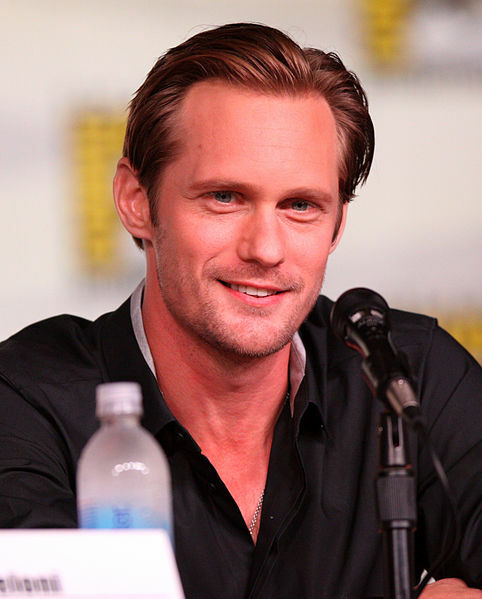 Skarsgård understands that “True Blood” receives a lot of attention. But after six months of playing Eric Northman when he shoots the season, the last thing he wants to do is play a character like Eric Northman in a film. He has most recently portrayed the character of Benji in Zal Batmanglij’s film “The East.” He will appear as Ray in the Duffer brothers’ film, “Hidden,” released later this year. Skarsgård is also currently in talks to play Tarzan in the upcoming film. Whether it’s a big budget film or a small indie project, Skarsgård will read the script — and if it’s good, he will get behind it. For him, it’s about the connection, the relationship and the excitement that he has with the character. Skarsgård is not a method actor. He reads the script once a day from when he receives it. He claims that this is his way of discovering new things about the character and coming up with new ideas — a factor that has led Skarsgård to persistently deliver solid performances in his work.